The Borgogno name is synonymous with Barolo and is intimately connected to many important historical and cultural events of the region. The estate was founded in 1761, pre unification of Italy (1961). In 1920, Cesare Borgogno took over management of the winery and began successfully exporting the wines abroad and cellaring wines to create a wine library of reserve wines for later release. The estate remained in the Borgogno / Boschis family up until 2008 when it was purchased by the Farinetti family, who were firmly committed to strictly following the original owner’s traditions. As of 2013 Borgogno went back to using concrete cement as the exclusive material for fermentation tanks and began their conversion to organic viticultural practices in 2016. The wines will be certified organic as of the 2019 vintage. The wine Borgogno Barolo DOCG undergoes spontaneous fermentation carried out by indigenous yeasts for about 12 days in concrete tanks, controlled temperature (22 – 25 C initially, 29-30 at the end ), followed by submerged cup maceration for 30 days, stable temperature 29 C. After the racking off, the malolactic fermentation starts, and it lasts about 15 days at 22 C. The wine ages for 4 years in Slavonian oak casks (4500L) with a further refining in bottle for 6 months. This is the classic, traditional method of Barolo production. This is Borgogno’s classic Barolo; it is a blend of Nebbiolo grapes sourced from five of the most prestigious vineyards of the Barolo area: Cannubi, Cannubi San Lorenzo, Fossati, Liste, San Pietro delle Viole. 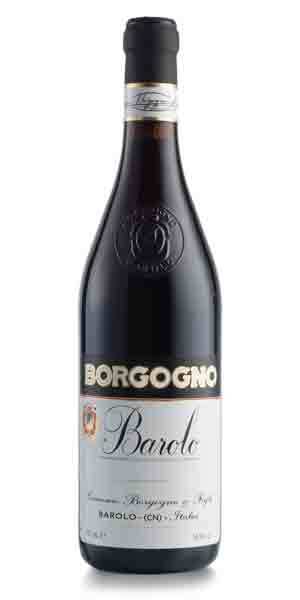 Barolo with cocoa, plum and fresh lilac aromas and flavors. Full body, firm and chewy tannins. Long, flavourful finish.